What Health Benefits Does Lycopene Provide? Including tomatoes and watermelon in your diet will give you the lycopene health benefits. 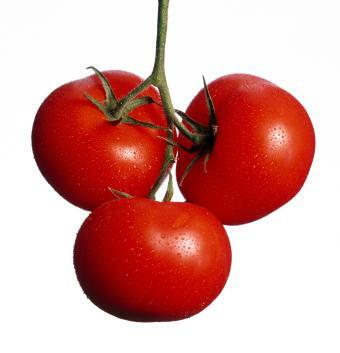 Lycopene is an antioxidant that gives a red color to fruits and vegetables. While scientists have yet to quantify a recommended daily allowance of this nutrient, research continues to find that lycopene helps prevent a growing number of diseases, especially cancer. Antioxidants like lycopene prevent the byproducts of the body's consumption of oxygen from damaging cells or causing chronic illnesses. This preventive action can slow down signs of aging while helping organs operate more efficiently. Lycopene acts in this beneficial capacity within the cardiovascular, circulatory, gastrointestinal, nervous, reproductive and skeletal systems. It also plays this role within the skin, helping it resist damage from the sun's ultraviolet rays. All of these protective effects within different parts of the body help slow down signs of aging in general and increase longevity. Brain and nervous system decay: Lycopene helps repair genetic material and prevents age-related degeneration of nervous system tissues and brain cells. Cancer: The nutrient's role as an antioxidant protects individual cells against damage that could pave the way toward cancerous developments. Lycopene also inhibits growth of cancerous cells. Studies have found lycopene reduces the risk of breast, cervical, gastrointestinal, colorectal, lung, prostate and skin cancers. Circulatory problems: Studies have linked lycopene with a reduced risk for high levels of bad cholesterol and clogged arteries, clinically known as atheroscerosis. The nutrient actually deters production of bad types of cholesterols while promoting helathier cholesterols. Researchers are still trying to determine the full extent to which lycopene helps prevent other types of cardiovascular diseases, including heart attack, stroke and high blood pressure. Kidney disease: The antioxidant effects of lycopene help keep kidneys functioning reguarly and prevent renal failures. Osteoporosis: Lycopene helps stave off bone loss that leads to brittleness and shrinkage of the skeletal system. Skin damage: Lycopene helps protect the skin against damage from sunlight, reducing the likelihood of sunburns and wrinkling in addition to skin cancers. Vision Loss: The nutrient maintains good eyesight and reduces the risk of blindess and other vision-damaging conditions. The nutrient is said to benefit the parts of the body where lycopene is stored and aggregated. Within the human body, lycopene is present in the adrenal glands, blood, breasts, colon, liver, lungs, prostate, skin and testicles. Lycopene health benefits are best realized from eating food containing the nutrient, rather than through vitamin supplements. Interestingly, cooking liberates lycopene rather than reducing its efficacy as is the case with other vitamins and minerals. Some of the most efficient ways to incorporate lycopene into your diet are tomato sauce, salsa and ketchup. Apparently, many people have a lot of room to improve this part of their diets: The Center for Food and Nutrition Policy says that 40 percent of Americans don't consume a single tomato-related product on any given day. While a recommended daily allowance of lycopene has yet to be determined, some nutritionists suggest ten servings per week of foods rich in the nutrient. Others simply say that the more lycopene you include in your diet, the healthier you will be in the long run. Consume lycopene in balance with the vitamins and mineras that do have recommended daily allowances. Researchers are studying whether lycopene might enhance the action of other nutrients and vice versa. So it's very possibe that lycopene's benefits are increased by other vitamins and nutrients. To learn more about this important nutrient, visit the websites of the American Cancer Society or Lycopene.com.